West Paw Design manufactures the highest quality dog and cat toys and bedding available, made in beautiful Bozeman, Montana, in the good ol’ U.S. of A. We are a small but mighty company dedicated not only to creating safe, fun, and durable products for your pet, but also to making a contribution to the greater picture. 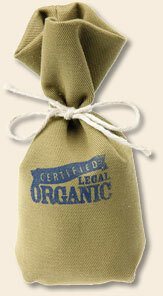 Rocky Mountain High is certified legal and more fun than a barrel of monkeys! A heaping sack of 100% premium organic catnip is wrapped in organic cotton and tied with a string made of reclaimed cotton. Bits of nip will tease and please the most aloof of cats as it slowly sprinkles it’s way out of the bag. This is the most Eco Friendly cat toy we offer. 6” tall. Home grown in the USA. Sure to give your cat the munchies. All cat lovers know that a cat gets what a cat wants, and cats want fun, healthy toys like Fish for Cat. Created from environmentally friendly fabric made up of 85% re-engineered recycled IntelliLoft™ fibers and filled with energizing USDA certified Organic Catnip. You won't want these Eco Toys to swim away, so let your kitty pounce on these new toy designs that radiate fun, with bright colors and sewn-in jingling bells. 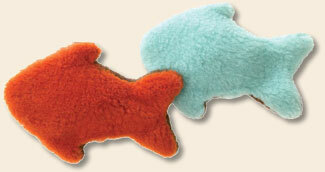 Fish for Cat measures 6 inches and is straight from a hatchery in Montana - Yep, made right here in the USA!